I’m planning a demonstration of some super simple but tasty ideas for cooking with tempeh. Watch this space! Seems like you can’t open a lifestyle magazine at the moment without finding an article about gut microbes. You know the sort of thing: we have ten times more bacteria in our bodies than human cells (a highly questionable estimate) and many of these bacteria are essential to the proper functioning of our digestive system. As a result we are bombarded with advertising trying to sell us ‘probiotic’ supplements. Now I am not a food-faddist. I believe that a balanced diet of predominantly natural foods (by which I mean not processed industrially) is what you need to stay healthy. But I reckon if there’s a chance that some of those natural foods could benefit the gut’s microbiota by providing ‘good’ bacteria, and they’re great to eat, then you have little to lose by eating them! Most of the foods that contain beneficial bacteria are made through the process of fermentation—the conversion of sugars and starch by microbes into acid or alcohol. Some of the well known products made this way are yoghurt, sauerkraut, kimchi (Korean), miso (Japanese), and sourdough bread. But there is one that I’m particularly fond of, because it is so delicious, and it comes from Indonesia! I’m talking about tempeh—apparently the only soya-based product that didn’t originate in China. 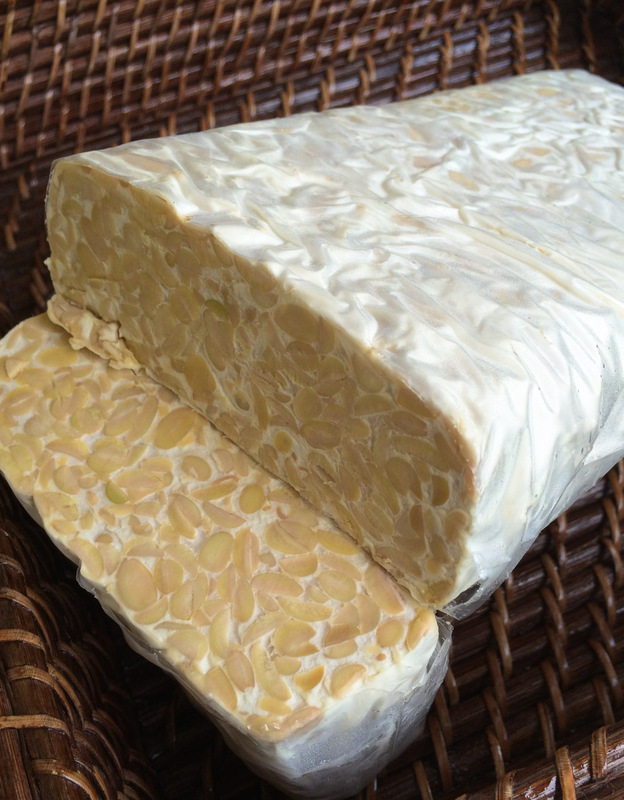 Tempeh is made from whole soya beans, bound together by the fermentation process into a cake. It is quite unlike the better-known tofu, which is made from soya milk. Tempeh has a firm texture and a nutty flavour, with a high protein, fibre, and vitamin content. Bit of a super-food really! My husband, Kevan, is luke warm about tofu. He absolutely loves tempeh. It seems to be cropping up more and more in the media, and becoming easier to get hold of. I get mine from my usual Chinese supermarket, but you can find it in health food shops, and as I write I see that Crossways Fruiterers, the charming independent greengrocer in Fernhurst, has just started stocking it. Tempeh is so versatile. 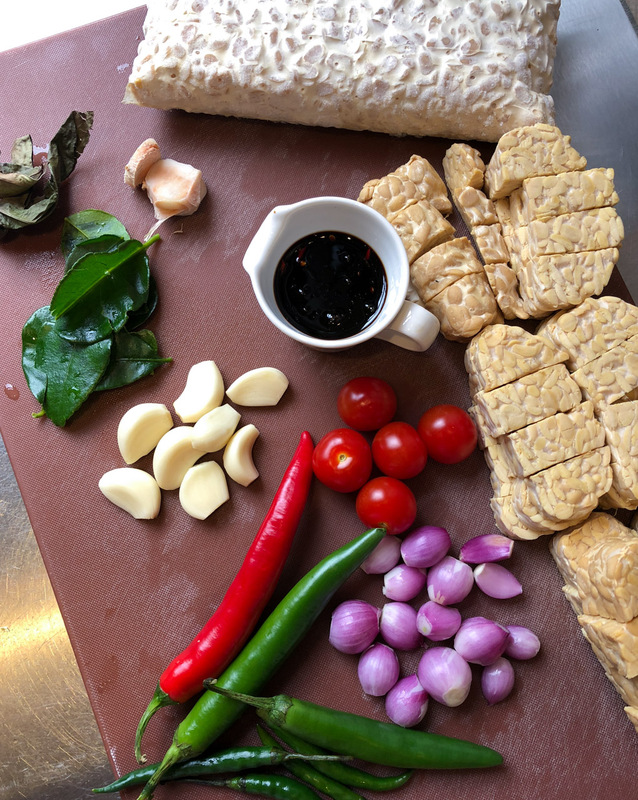 Recently I posted on Instagram a simple, yummy Javanese snack called tempeh mendoan sambal kecap, which makes a wonderful canapé. 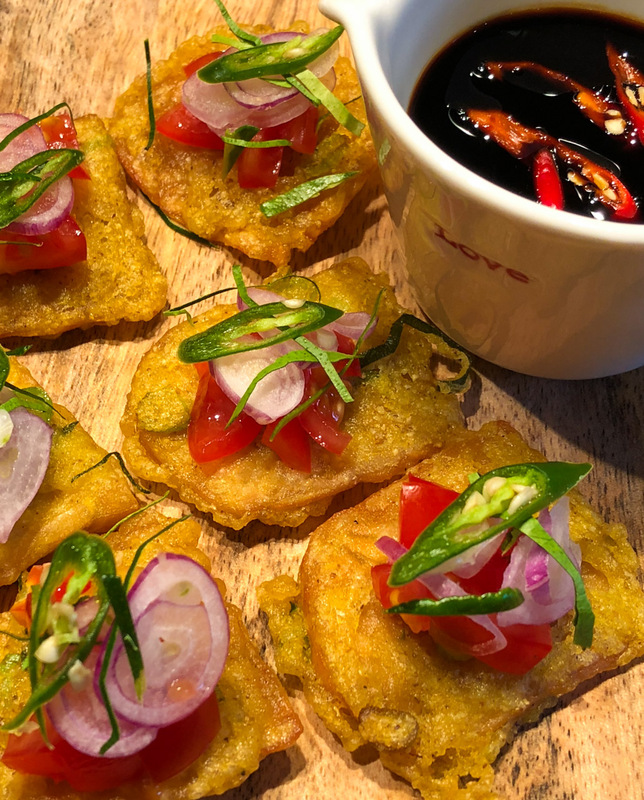 Thinly sliced tempeh is coated in a spicy batter, fried quickly, then topped with a fresh sambal made with sweet soya sauce. Yesterday I made a batch of the delicious stir-fry called, in Javanese, oseng-oseng tempeh. Here’s how I make it. 1. Slice a block of tempeh into strips. 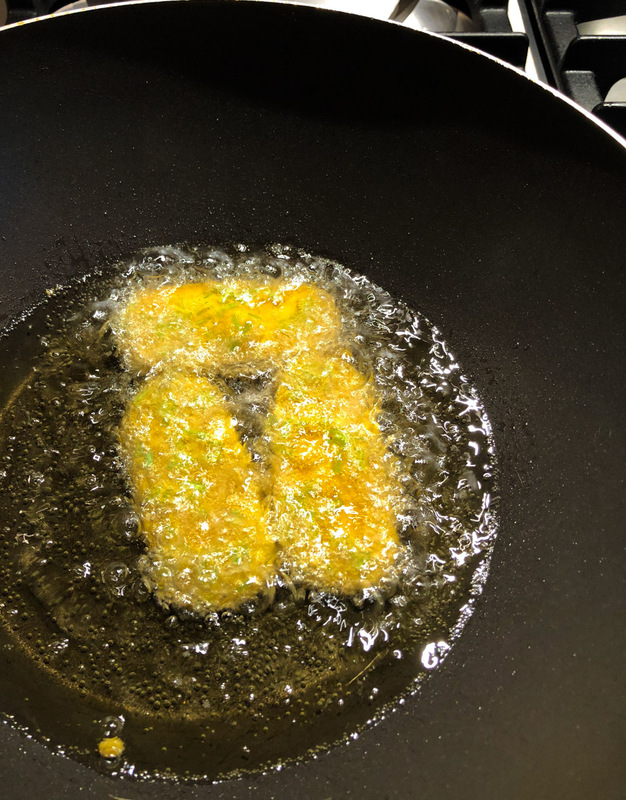 Fry these for a minute or so in very hot oil—I use sunflower oil; rapeseed oil is an alternative. They should stay soft—don’t overcook them. Remove the tempeh from the oil and set aside to drain. 2. Coarsely chop shallots, garlic, chillies (red and/or green), and galangal, and fry in the same oil with a few lime leaves and bay leaves. 3. 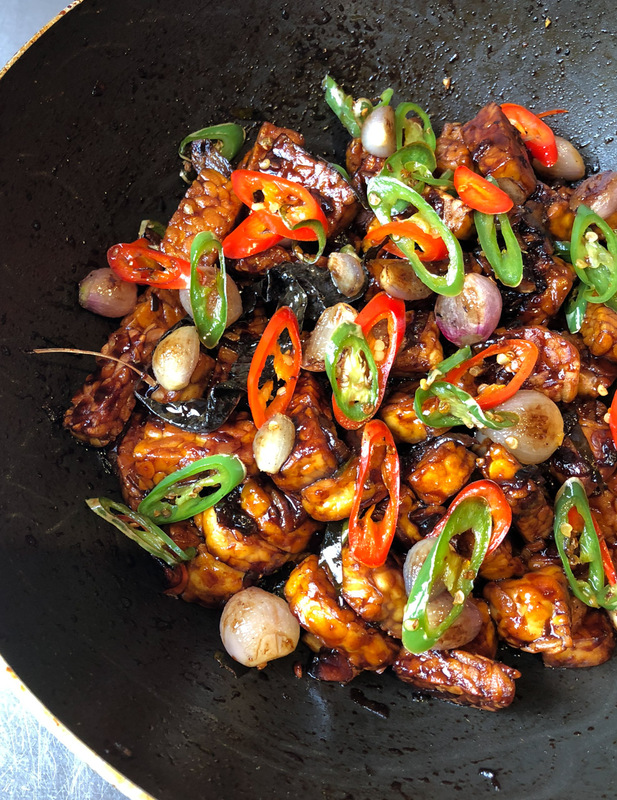 Once the vegetables have softened and their fragrance released, add the tempeh and stir together with kecap manis (sweet soya sauce), a little tamarind sauce, and salt and pepper. 4. Finally I might add halved cherry tomatoes for the last few seconds of frying. 5. Put everything onto a serving plate, or a freezer container. We like our food chilli hot, so I top with whole grilled green chillies. Let the dish stand for a few hours for the flavours to develop before warming and serving, or freezing. All the ingredients can be found in the bigger supermarkets, even the galangal and tamarind sauce. I don’t think it will be long before they start selling tempeh too. Give it a try. I hope you love it as we do. And who knows, its fermentation genesis might give you a bacterial boost! And in case you’d like more inspirational ideas on what to do with tempeh I’m planning a cooking demonstration some day soon. Meanwhile let me know if you think it’s a good idea. 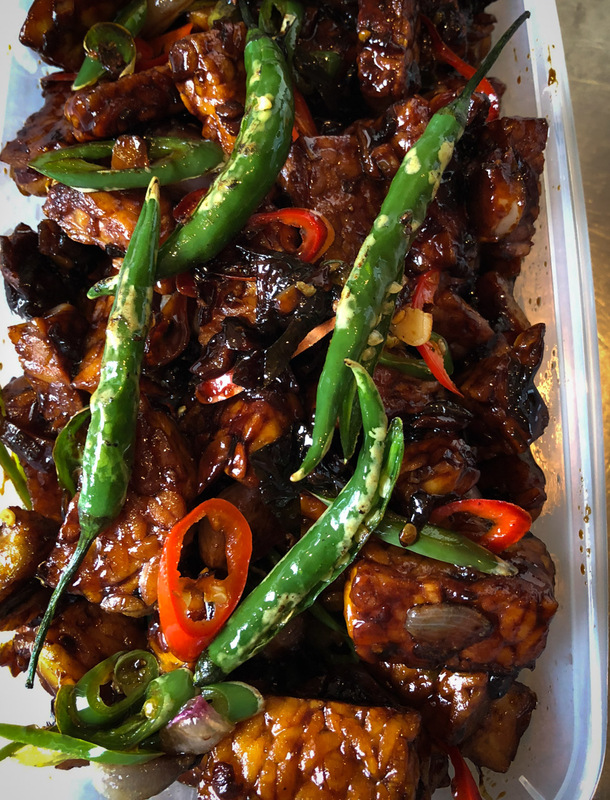 I think they have marinated tempeh in the UK too—but it’s not common. When I want marinated tempeh I marinate it myself, like I marinate many foods. There’s not much I don’t marinate! When you say you can’t eat plain tempeh, you mean you don’t like the flavour? You should try the dish in my blog!